It's been over a month since a security breach prompted Sony to shut down the PlayStation Network, and the service is still hobbled. 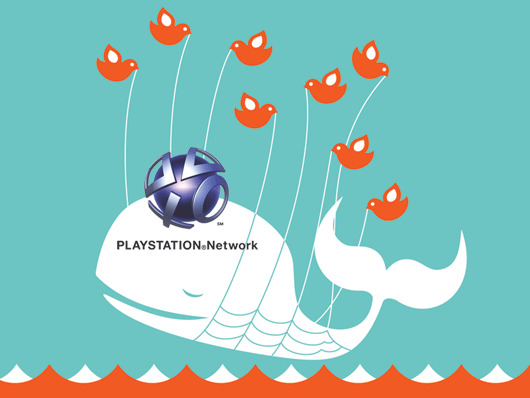 Now, it's time for Sony to pick up the pieces: the network has been (supposedly) strengthened, Kaz Hirai has issued a formal apology, and players are being welcomed back to PSN with a "customer appreciation program." While the prospect of a couple free games is always a welcome one, I'm uncertain as to how much Sony has actually learned from this whole ordeal and whether this program truly shows the proper amount of appreciation towards players and developers. The free games offered as part of the deal are a nice gesture, but the selections seem overly limited and smell of short-term opportunism. While all the games seem like high-quality titles, they fail to show off the newest and most innovative things the PSN has to offer. Dead Nation came out in the U.S. last November. Wipeout and Super Stardust HD are both years old and similar to other games that can be found on the PC, Xbox, and Wii. LittleBigPlanet's sequel effectively renders the first game obsolete. Sony knows it won't sell any copies of Infamous once the sequel comes out in a few weeks, so giving the game away seems more like a marketing ploy than a show of good will. If Sony is going to offer free games, why not focus on experiences unique to the PSN? Why aren't any of the PixelJunk games featured? Where is Fat Princess? Why not drum up anticipation for That Game Company's forthcoming Journey by giving away Flower? Why not show off the potential for massively-multiplayer games with MAG? If Sony truly wanted to mount a compelling "welcome back" campaign, they should have made it a point to show people that coming back is worth it. Though the past month has been a disaster, Sony could have used it as an opportunity to get a jump on the rapidly-approaching digital future. While there are undoubtedly retail agreements to consider, Sony had the opportunity to make a bold statement by making games like LittleBigPlanet 2 or SOCOM 4 free for a month. They would have most likely taken a short term loss, but attracting people to the system and demonstrating that first-run games are conveniently accessible on the PSN would have eventually paid off. On last week's podcast, I said that the way Sony treated developers in the aftermath of the outage would influence my feelings towards the company. As of now, Sony's actions are less than inspiring. I can only assume that third-party developers are even more irritated at Sony than players, as the outage has literally cost them money. Apparently, Sony couldn't be bothered to strike any deals with multi-platform developers as part of this "welcome back" campaign. Small, yet brilliant games like Stacking that released DLC shortly before the outage missed out on an entire section of the gaming market. Development companies counting on a specific launch window have had their plans destroyed. Larger developers like NetherRealms have had to kludge together workarounds so that players who bought Mortal Kombat can play on-line. I'm sure Gabe Newell, a well-known PlayStation critic, was none too pleased that Valve's grand PS3-Steam-Portal 2 campaign was crippled by Sony's network. Through it all, Sony has been very quiet about what it is doing to win back developers' trust and compensate them for their losses. Disappointing as it may be, it is totally understandable why a small developer like Supergiant Games would agree to a platform-exclusive publishing deal with Warner and Microsoft. Not only does Microsoft do a better job of promoting games, their network actually works. Who could blame a small company for going with a sure thing? As a company, it seems that Sony is suffering from a severe case of nearsightedness. The video game world is going digital and players will increasingly be able to personalize their on-line experience and purchasing decisions to fit their specific tastes. Offering people a meagre selection of curated games, most of which do little to show off the PSN's benefits, is not the best way to compensate people for their inconvenience or convince them to spend time on the network. Make this more than a "welcome back" to the PSN, make it a "welcome back" to the PlayStation brand. Give away some classics like Final Fantasy VII and Metal Gear Solid to remind people why they first fell in love with Sony consoles in the first place. Augment these classic memories with some recent examples of innovative PlayStation exclusives like PixelJunk Eden, Flower, and M.A.G. Recognize that people enjoy being able to make their own choices. Bite the bullet and simply credit people's Sony e-wallets with enough money to buy a game or two. This serves the dual purpose of providing people with the means to buy games that interest them in and allows Sony to demonstrate their confidence in their network's security. Work harder to showcase new and innovative games from both independent studios and large publishers. This probably necessitates a UI change, but players need to be able to see what is new and exciting the minute they connect to the network. Moving the scrolling news bar from the upper right to the bottom of the screen and expanding it enough to show pictures would accomplish this. Players deserve to be able to make the decision as to when and how to buy a game, and developers deserve Sony's support for choosing to use their network to conduct business. Learn from Microsoft's example and start promoting the benefits of PlayStation Plus. Give away free weekends, integrate Sony's on-line movie store with the service, or make more free games available with a membership. I didn't need or want a PlayStation Plus subscription before the PSN went down, and Sony hasn't made the case for why I should be excited now that I'm getting 30 days of it for free. All these things would help Sony start the rebuilding process while laying the groundwork for the future. As it stands now, Sony has made it clear they are very sorry for what happened and they are working to make things better in the future. However, their actions are not those of a company looking to grow and strengthen itself after a setback. Sony is behaving like a company desperately trying to reconstitute a status quo that, at best, could have been called "acceptable." Such an approach shortchanges everybody involved: Sony, game developers, and players. The whole thing doesn't change my scepticism towards a fully digital industry... Another "unsolicited advice": Don't give your german users crap/old games (LittleBigPlanet, Super Stardust HD, WipEout HD/Fury, Ratchet & Clank: Quest for Booty, Hustle Kings). Call me crazy, but the crash of PSN is not as big as people make it to be. If you payed for PSN plus I understand, but the majority of people don't pay for it. The thing is everyone makes it seem like Sony is just letting everyone down, but it could happen to any system. I am not personally a PS3 owner, only because of my budget to spend on video games. If hackers really wanted to, they could launch an attack against 360 or Wii(but who would care about Wii). Identity theft happens to a lot of people, including myself. It is an easy fix, and the majority of Credit Card companies will reimburse you for purchases that were not actually you. I guess I just look on the brighter side of life. To think that this is the end of Sony, is crazy. I think your right in that they should admit to fault. At least a sorry for being hacked, and down should do the trick. If they payed for PSN Plus give them there months money back, plus a game. Agreed regarding the problems of a digital future. I'll hang on to discs as long as I can. Also, great point about the absurdity of region-specific choices. Whatever happened to the WORLD WIDE web? True, it's always good to keep things in perspective. Like you, I've had my information compromised before. It's a major inconvenience, but there are worse things in life! Most people probably don't care about the PSN thing very much and this thing won't cripple Sony. But I do think this whole situation points to a larger flaw in Sony's long term strategy. They've been coasting since the PS2 and they're getting totally outclassed by Microsoft, Valve, Impulse, etc. in terms of embracing the new way of doing business, which doesn't really help anyone.